The New York Times Asks: Is This When LeBron Finally Beats The Knicks? James demurred when asked how he might remember his Garden playoff debut. "We won," he said. "That's all that matters to me." Then, one game away from a sweep, he described the Garden as a "hostile environment." James once scored 50 points at the Garden and has turned in many other memorable performances. But he has never eliminated the Knicks. "Demurred" here means "didn't give a crap about my ginned-up question." Q: What's it like to beat the fabled New York Knickerbockers, LeBron? A: It's like beating most other teams, only maybe easier? He has never eliminated the Knicks. Here are some other teams that LeBron James has never eliminated from the playoffs: The Milwaukee Bucks. The Minnesota Vikings. The 1930 Philadelphia Athletics. How do you even write that passage? Times sportswriters are spiritual kin to the folks at the Indianapolis Star who insert "Hoosier" before the name of anyone from Indiana in the national wire copy. The idea that the Knicks are some kind of measuring stick for basketball greatness is insane. The Knicks are the sign shaped like an anthropomorphic puppy saying you have to be at least three-foot-six to get on the teacup ride. The last time the Knicks had a championship team, LeBron James's mother was in kindergarten. 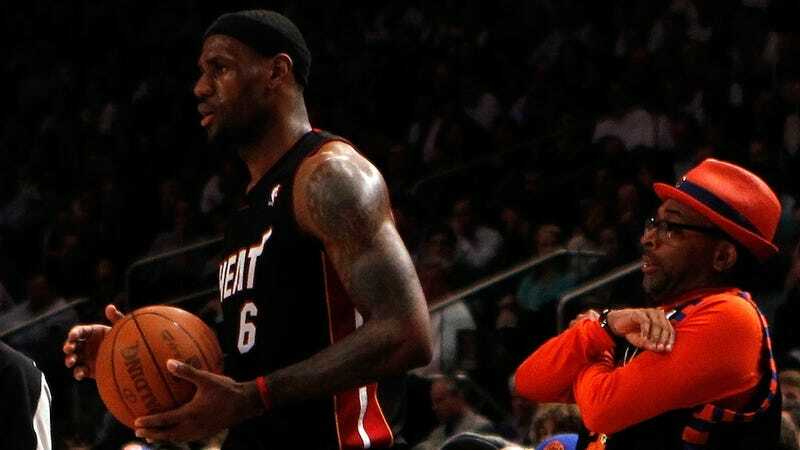 The Knicks were 0-3 against the Heat in the regular season, and now they're 0-6. Their most notable accomplishment was running their coach out of town. Now a mediocre, disjointed, injury-plagued team is getting blasted out of the playoffs by the defending Eastern Conference champions. Here's what LeBron James most likely thinks about facing the Knicks in Madison Square Garden: nothing.